Primate Anatomy is unlike ay other work on primates: it systematically reviews the biology of all living primates, including humans. It describes their bio-geographical information and provides crucial data pertaining to their body size, fur coloration external distinguishing features, habitat and basic life strategies. 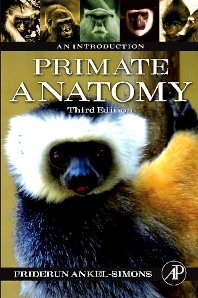 Now in its third edition, Primate Anatomy discusses species that are new to science since the last edition with details concerning anatomical features among primates that were re-discovered. New research in molecular primatology is also included due to recent relevant findings in molecular biology in accordance with new technology. The basics of biological taxonomy are introduced, along with photographs of all major groups. Important new and controversal issues make this edition key for every primatologists, anthropologist, and anatomist. Tooth Morphology and Diet; can they Reliably be Correlated? What is New in Tooth Research? Dr. Ankel-Simons did her graduate studies in marine biology, marine ecology, and marine geology at the University of Copenhagen, the Marine Biological Laboratory at Elsinore, Denmark, and the University of Giessen, Germany. She was a member of the first research team to keep the folivore primate Alouatta palliata alive in captivity for a long term of several years at the Max Planck Institut for Brain Research, Giessen, Germany. Since 1996, she has been a Research Associate in the Division of Paleontology at the Duke University Primate Center. She has published three books and numerous journal papers.